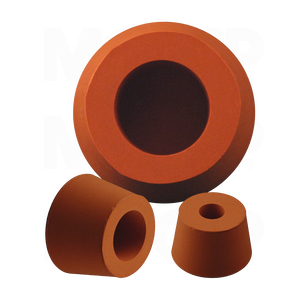 MOCAP Tapered Hollow Silicone Rubber Plugs offer the function of solid rubber plugs but with a material reducing, cost saving hole on the small diameter side. Silicone rubber product plugs resist temperatures up to 316°C (600°F) and are perfect for E-coating and powder coating applications. Also good for chrome plating. Reusable in many applications. Hollow silicone plugs are stocked in sizes to fit 22.2mm (0.875") through 127.0mm (5") diameter holes. MOCAP's line of rubber masking products includes EPDM and silicone rubber plugs and caps stocked in many sizes for immediate shipment.